The current visitors at the great estate are from Our Planet magazine — Lucas Penrose Bell, who’s an insane immortal warlock, and Alice Rigby, who’s a girl photographer. Alice thinks that they’re here to do a feature story on America’s hauntedest house, but Bell is actually here because he’s got a very long-standing grudge against the Collins family, and he’s planning to murder his hosts. 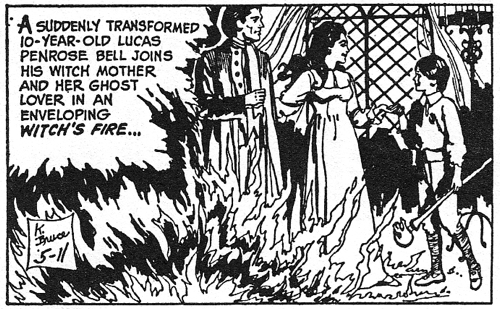 You see, back in the 1670s, Bell’s mother Mathilda was burned at the stake for being a witch, which she was. The main witness against her was Eban Collins, and as she was burning, Mathilda put a curse on Eban and his family. Eban would haunt the earth forever, neither dead nor undead, and everyone in his family would die, eventually. The problem is that she tasked her ten-year-old son Lucas Penrose with the job of destroying the Collins family, and he’s been taking his sweet time about it. It’s now 300 years later, and there are still Collinses walking the earth, living in an estate called Collinwood in a town called Collinsport, so how Lucas missed these last two is anybody’s guess. Mathilda is apparently able to enchant specific pieces of burning wood, and make people impervious to everything but fire. That’s a pretty weird power set, and it makes me wonder how they ever caught her, if she can do stuff like that at a moment’s notice, while being currently on fire. Bell had the stick made into a wolf’s-head cane, which he carries everywhere and always manages to get into the shot. He must have come from the same acting school as Grayson Hall, who insisted on having her hands in the frame, whether she needed them there or not. 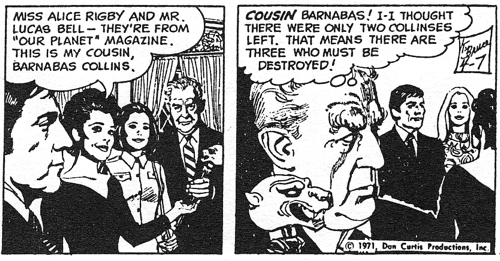 So obviously Barnabas and Bell should be best friends; they’re cane bros. But no, now Bell decides that he has to destroy Barnabas too. Now, Barnabas has been having strange forebodings for three weeks and counting; that’s how things work in this comic strip. Everyone is always sensing things, which is narratively convenient, because you don’t need to actually explain how a character knows anything. He does this pretty much non-stop. If you’ve ever wanted an ominously vibrating vampire, your ship has come in. Following the trail of his strange foreboding, Barnabas heads to the archives, where he finds that there’s no date of death for Eban Collins. This book-keeping error stirs him up considerably, and he asks, “Can it be that Eban Collins did not experience a mortal’s death?” This doesn’t mean anything in particular. That “descendants” thing is still getting to me. If the idea of the curse is to kill everyone in the family, then the fact that some of them will get old enough to have descendants kind of lets the air out of the whole enterprise. 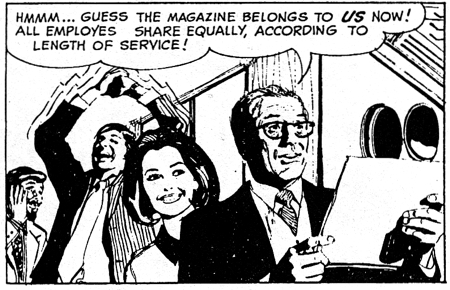 This bothers me more than it bothers anyone in the comic strip. But of all the confusing elements in this story, the most confusing is the Bells’ relationship to fire. Mathilda burned at the stake, and according to the ancient magick she whipped up on the spot, young Lucas Penrose was made invulnerable to everything but fire. I’m not sure why the fire is upset with Lucas. Yes, it’s the only element that can destroy him, but ancient enemies? What could you possibly do to piss off fire? Barnabas wraps up his research, and goes to confront Lucas, who’s still doing an amazing job of keeping that cane in the shot no matter what. So this is how things work in comic strip Collinwood; everybody stands around and senses each other. This makes things more efficient, and it means that a single conversation only takes five days, a breakneck pace for this genre. 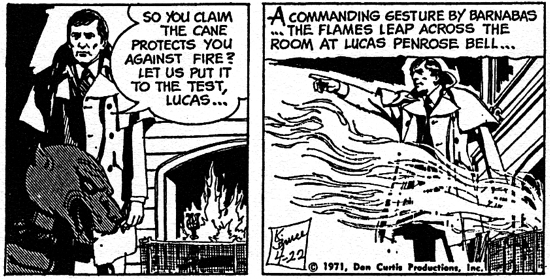 It’s a general rule in comics that nobody really has a clear idea of how fire works; this is a tradition going back to The Fantastic Four, where Stan Lee decided that the Human Torch could use fire for anything, including a flame lasso that could pick up objects without burning them. So this perfectly ordinary household fire keeps extending way past the boundaries of the fireplace, this time at the command of Barnabas, who doesn’t usually have fire-control in his skill set. But Bell’s ready for this; it’s why he carries his weird cane everywhere. He lifts the stick and cries, “Back, flame — back to your fiery cage!” which I don’t understand, but you have to admit sounds pretty cool. 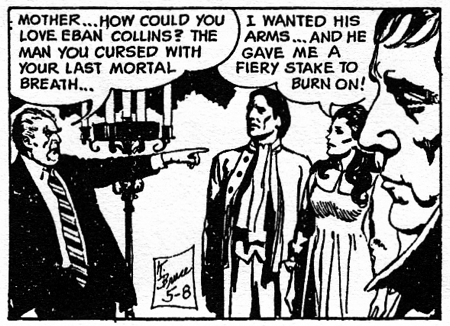 After a few more days of random tussling, Bell shouts, “Fires of vengeance — I command you to turn on him who would destroy me!” And suddenly Barnabas is enveloped in flames. So I’m having a hard time following whose side fire is supposed to be on. Isn’t Bell supposed to be the ancient enemy of fire? Or was that somebody else? Anyway, Barnabas doesn’t get burned; by Monday, the fire just goes out on its own and he isn’t even singed. The fire was just kidding. 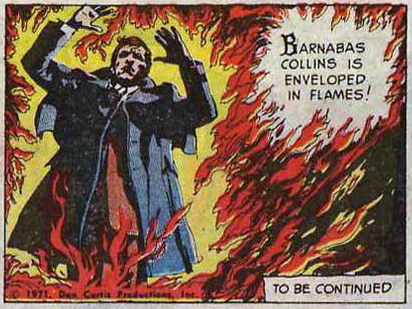 This happened in one of the Gold Key comics too; people are always trying to set Barnabas on fire. He must look irresistibly flammable. Left with nobody to talk to, Barnabas goes to the portrait gallery and conjures up the spirit of Eban Collins, who is neither dead nor undead. Talking things over with Eban, Barnabas wonders, “Is there nothing that can stop the power of that witch’s flaming hate?” This is wonderful, because it sounds like the kind of Fridspeak that’s usually an active collaboration between the original script and the demons who live in Frid’s mouth. Delightfully, while he says this, he’s actually looking off camera towards the teleprompter. He does that a lot in the strip, actually. 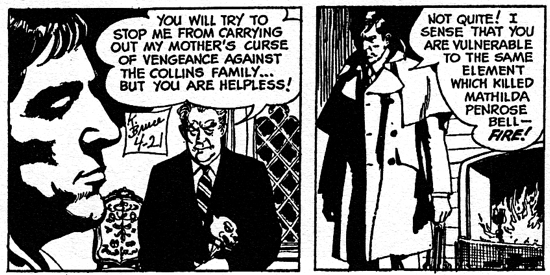 Go browse back through the pictures, and you’ll see more examples of comic strip Frid actively searching for his cue. There’s a twist, obviously, because otherwise it would be hard to wrap all this up. It turns out Mathilda was actually in love with Eban, and her curse was just a way of staying in his life, post-breakup. Camp-wise, the key line is, “I wanted his arms… and he gave me a fiery stake to burn on!” I would like to issue a challenge to the reader: find a way to use that line in conversation. It will bring you nothing but success. Surprisingly, Eban is instantly 100 percent receptive to the idea of settling down with the woman who killed everybody in his family. That’s because this isn’t actually a ghost story, or an adventure story. It’s a soap opera, a genre where the itch for romance is so strong that you only have to put a man and a woman together in a single shot, and they’re in love. That trope exerts a gravitational pull that’s far stronger than the relatively feeble draw towards consistency and logic. 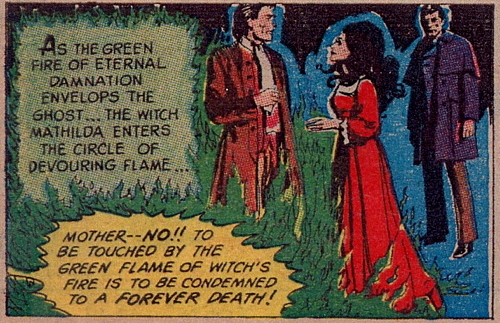 Unable to accept this upsetting change to the status quo, Lucas conjures up some witch’s fire, which is apparently a thing, in order to destroy Eban. He’s way off script at this point — he came to Collinwood with the intention of killing Elizabeth and Carolyn, and I don’t think he even remembers they exist. I don’t know how you can publish a world-class haunted house magazine with an attention span this short. There are no further updates on the difference between a regular death and a forever death. Anyway, it all works out. Lucas suddenly turns into the ten-year-old boy that he was when Mathilda was killed, and he walks into the green fire to join his family in eternal rest or damnation or whatever they’re heading for. This is another example of the gravitational pull towards the sentimental happy ending, with a couple united with their loving son. The fact that Eban is not actually Lucas’ father doesn’t seem to occur to anyone. Optics are everything. So I’m not sure what’s going to happen to Our Planet, America’s premier three-century vengeance magazine, with cover stories like “The Collins Family Must Be Destroyed” and “6 Simple Ways to Join Your Mother in Eternal Rest”. I guess they could always pivot to recipes and craft ideas, in a pinch. The three unhappy spirits disappear in a puff of smoke, taking the storyline with them. Now all that remains is for Barnabas to explain to Liz and Carolyn why they’re now minus one grouchy houseguest. The females heard the screams from Lucas’ guest room, of course, and they’ve come running, which proves that there is actually a volume level that you can reach where the residents of Collinwood will take notice. Obviously, this means that Barnabas has murdered a houseguest, but Liz never really wanted Bell here anyway, so she’s not super broken up about it. 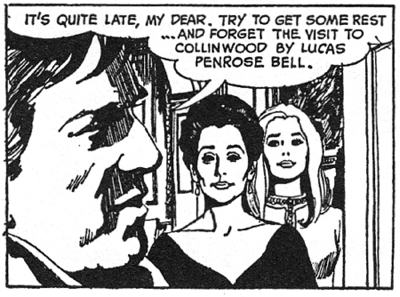 “Try to get some rest,” Barnabas advises, “and forget the visit to Collinwood by Lucas Penrose Bell.” This is an excellent idea. Tomorrow: The Bite of Love. It also sounds like some angry “Men are from Mars, Women are from Venus” line.